Twitter has just announced, via a Tweet naturally, that they have updated the ‘Following’ page that you see when you click on the list of people that are following you. Update: They’ve also added a nifty “stumble” button. The new following page will now show you a list of Tweets from the accounts that your follower is themselves following. You can also see a list of the accounts that your follower is following. 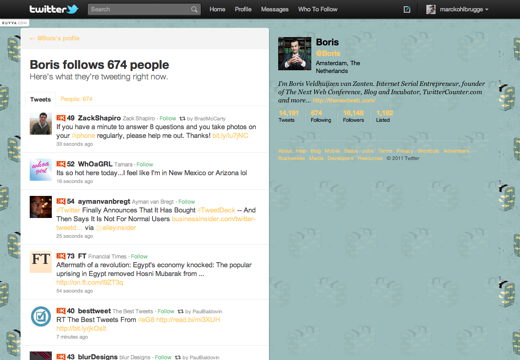 You can see above that you will be able to click on a person that you’re following and see Tweets from their followers. This means that you are effectively looking at their Twitter stream. This is a first for Twitter, which has previously avoided any outside viewing of the Tweets coming from your followers. Currently, when you click on the Followers option you’re presented with a list of the people that are following you. You can then click on them to see statistics about their account and a short list of recent Tweets. Interestingly, the current Following page does already give you the option to click on ‘Following’ to see a list of users that that person follows. This may be getting condensed to the previous page, where normally you just get that short list of Tweets. In an interesting historical twist, Josh Russel pointed out to us that this is a form of resurrection for Twitter’s ‘With Friends’ feature. Nearly two years ago Twitter disabled the With Friends tab that used to appear on user profiles. This tab allowed you to see a similar feed of your friend’s follower’s Tweets. Thanks to Marc Köhlbrugge for the screenshot of the new Follower page.